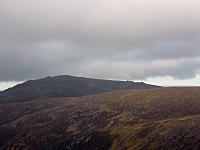 Bynack More is an elongated conical top orientated N to S on the E margin of a high plateau that supports two other peaks Bynack Beag (964m) to the NW and A' Choinneach (1017m) to the S . Most slopes leading to the plateau are fairly steep and there are some rocky outcrops. 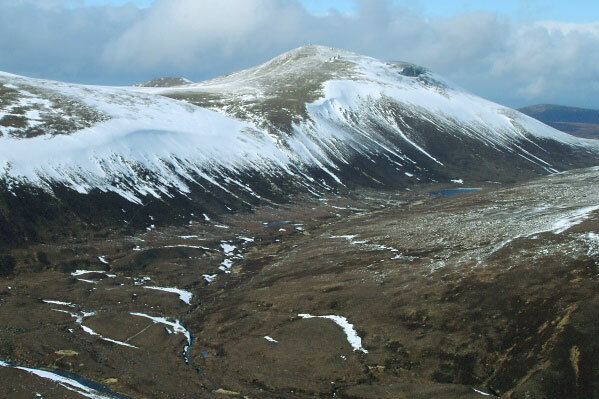 The normal ascent routes are from the N via the crest of Bynack More's N ridge, or from the Saddle overlooking Loch Avon via the SW ridge of A' Choinneach. Either way it is a longish walk in. Lookin south to Beinn Mheadhoin from the summit of Bynack More. Bynack More from the south-east across the Lairig an Laoigh from Beinn a' Chaorainn. The Fords of Avon is in the foreground in the bottom-left corner. 14th March 08. 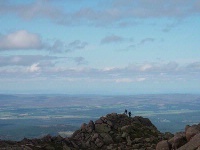 The summary information of one or more ascent routes that include Bynack More. 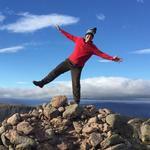 1 1010 m 21.66 km 6.5 hrs Bynack More A moderate length route on track/path and easy slopes. 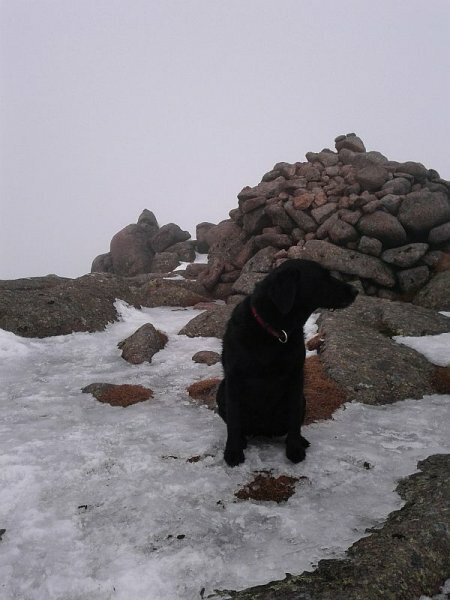 Jorja at the summit, in a bit of a chilly breeze. March 2013. Post a few words about Bynack More or read what others have had to say. Climbed on 8/8/09. This was my first of three climbing days in the north. On the way to Inverness I stopped at Glenmore Lodge and took the path past An Lochan Uaine towards Ryvoan bothy, where I had been a couple of years previously to climb Meall a' Bhuachaille. Took the right turn and headed for Bynack More - an excellent but fairly long walk. The summit boulders were impressive and it was unfortunate that I was too tired to go onto the barns. Clear weather meant great views at the top and a fine day out. 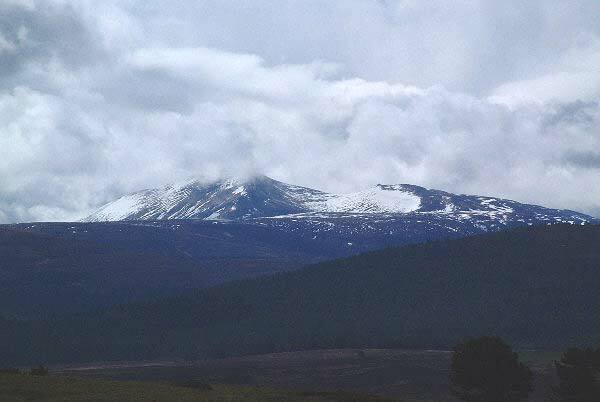 This excellent mountain makes for an easy day's walk from Glenmore Lodge. This was my first full winter climb and I would reccommend it to those who are looking to start winter walking with everything that goes with it. We were lucky to have superb weather and your camera will be used to the max. The whole route in deep snow etc. took 6 hours. Good hill, made more fun by climbing it in gale force winds with two nights gear on our backs as part of a mountain proficiency course. Came in from the north and carried on down the east side into the glen to camp at fords of avon. Stunning views south and the barns make a good photo oppurtunity!! 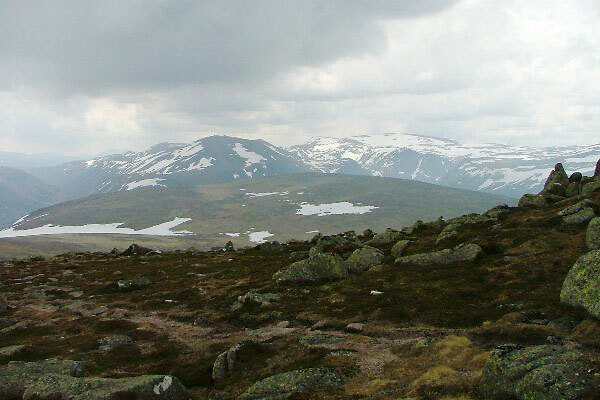 Excellent walk on tracks and interesting views, of centre of cairngorms. From summit if weather is good, it is possible to continue on and include Beinn Mheadhoin and Cairngorm in superb circuit taking 10 hours, good idea to leave a bike at Coire Cas car park to speed descent to Glenmore Lodge.